ENDUREX™ 300 SERIES | Wrisco Industries Inc.
Wrisco offers the widest range of core/stabilizer and finish options available. This assures you the best possible solution and longest lasting panel for your building, storefront or curtain wall. Review all the Endurex™ 300 Series offerings to find the right choice for your building requirements. Wrisco’s Endurex™ line of exterior architectural products focuses on extending the life of the building. 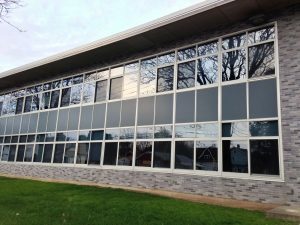 Endurex™ 300 and 305 are the only ¼” glazing panels offering a solid plastic core that will not absorb moisture and yet offer exceptional impact resistance. The most innovative “next generation” glazing and storefront panel available. This 1/4” in-fill panel features .015” smooth or embossed aluminum on both sides of a solid thermoplastic core. It combines all the best features of moisture and impact resistance with excellent rigidity. 1/4” glazing panel with all the exceptional features of the Endurex™ 300 above, with a Kynar® or Anodized finished aluminum. Moisture resistant, 1/4” glazing panel with .015” smooth or embossed aluminum on both sides of a corrugated plastic core. Moisture resistant, 1/4” glazing panel with .032” smooth or embossed aluminum on both sides of a corrugated plastic core. 1/4” glazing panel with .015” smooth or embossed aluminum on both sides of a tempered hardboard core. 1/4” glazing panel with .032” smooth or embossed aluminum on both sides of a tempered hardboard core. Fire and moisture resistant 1/4” glazing panel with .015” smooth or embossed aluminum on both sides of a cement board. Fire and moisture resistant 1/4” glazing panel with .032” smooth or embossed aluminum on both sides of a cement board.